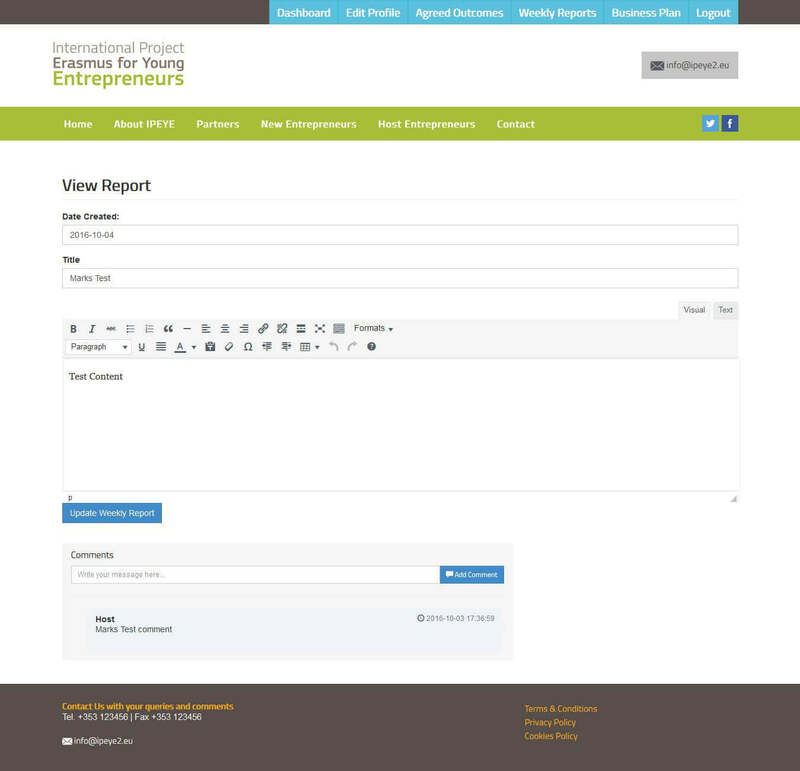 The international project for European young entrepreneurs (IPEYE2) is a web application enabling a variety of pan-European stakeholders to share information and collaborate on entrepreneurial projects. The application brings together potential entrepreneurs and host entrepreneurs to work together on projects that are innovative and have huge growth potential. As part of the web application IPEYE administrators can add new users to the system, can match host entrepreneurs with new entrepreneurs and can enable access for partners in different countries to monitor and manage entrepreneurs. 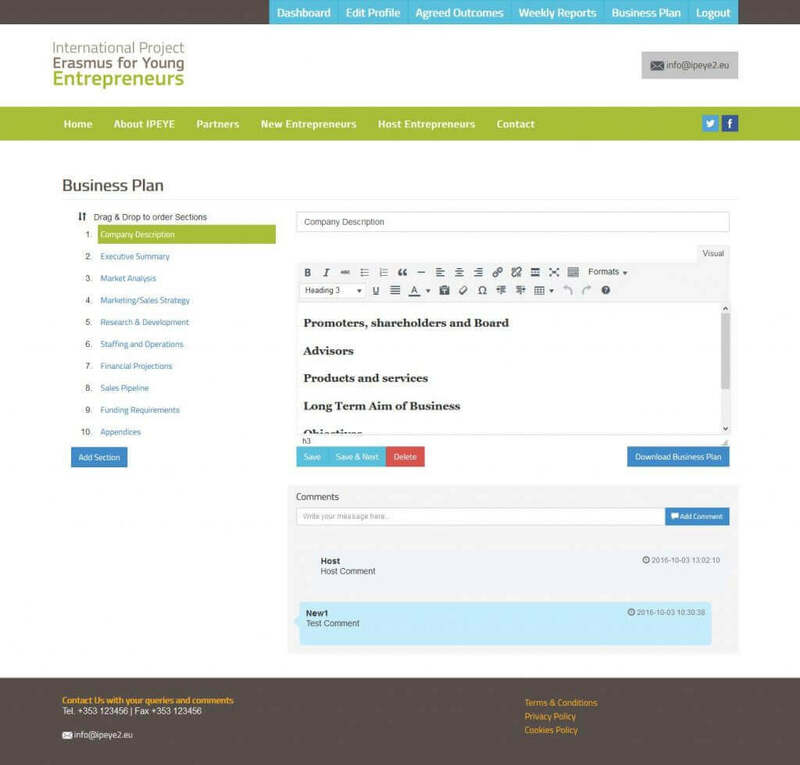 This interactive website application enables new entrepreneurs and their host entrepreneurs to collaborate in setting goals and planned outcomes, creating business plans and providing weekly feedback reports with the facility to add comments to each type of interaction. Another often overlooked aspect of all our websites is the usability factor. We make websites that are easy to use. We also make them look good. Our graphic designer is an expert in interface design, usability and user experience design ensuring a pleasant experience for multiple user types. As with all of our websites this web application has a content management system, enabling the web administrator to add and manage users, edit and update page content, and take control of all aspects of the website. The site had four different types of users; Administrators, Partners, Host or experienced Entrepreneurs & New or aspiring Entrepreneurs. One useful approach at the early stage of this project was the incorporation of User Stories which helped with getting high level definition of requirements for the site. Some user stories were added to the above product backlog as the project became more clearer to the stakeholder. During each sprint, some users stories were selected to be completed by the end of the iteration. Stakeholders conducted regular reviews at the end of each iteration resulting in much better communication & ability to manage change quicker. In conclusion, the project is considered a success by all parties involved.